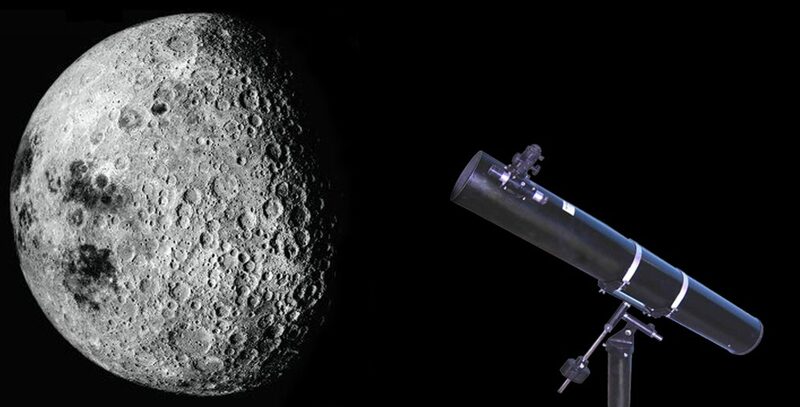 If you do not want to spend much on your hobby of star gazing, why not make a telescope of your own? Buy our DIY telescope making kit and enjoy the wonders of the Universe. Our entire ready to use telescope models come in the kit form also. 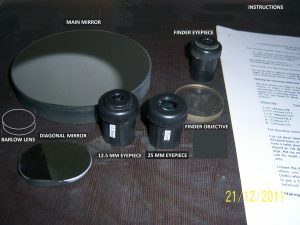 The standard kit includes all the finished optical components needed to build a Newtonian reflecting telescope; namely, the primary concave mirror, the secondary flat mirror, two eyepieces of 25mm and 12.5mm focal lengths, one Barlow lens that increase the power of any of the eyepieces from 1.5x to 4x times, a 25mm diameter objective lens and eyepiece to make a 6x power finder telescope and complete easy to follow instructions on how to build the entire body of the telescope (main tube, mounts for the mirrors, eyepiece focuser, tripod stand etc.) from parts that are readily available at most hardware stores. Even so, if you wish to buy any or all the other parts readymade from us, you can do so at extra cost. If you have some simple tools at home and a slight mechanical bent of mind, you can easily make your own telescope from the kit which will perform as good as our readymade telescopes but at a fraction of the cost. It is advisable to build a telescope not less than 5” (125mm) mirror diameter so that fittings inside the tube can be done without the use of special tools. All the optical components supplied in the kit are of the same diffraction limited optical quality as used in our ready made telescopes so image sharpness, brightness and magnification range in your home made telescope will be the same as that of our factory made telescopes. *Many people buy these readymade to save time without having to spend too much extra money. If you wish you can buy any or all of the above components readymade from us at extra cost. If you choose to buy all the components ready made, then all you have to do is assemble the various parts to make the entire telescope similar to our readymade telescopes. Note: You will not be saving much in terms of money if you buy all the components readymade from us but of course, you will be saving your precious time in making those components.